Synthetic peptide corresponding to Mouse IL-21R aa 35-65 (N terminal). Our Abpromise guarantee covers the use of ab13268 in the following tested applications. Selectively expressed in lymphoid tissues. Most highly expressed in thymus and spleen. Belongs to the type I cytokine receptor family. Type 4 subfamily. C-mannosylated at Trp-214 in the WSXWS motif, the sugar chain makes extensive hydrogen bonds with Asn-73 sugar, and bridges the two fibronectin domains transforming the V-shaped receptor into an A-frame. Immunohistochemistry on mouse thymus with rabbit antibody to N-terminus of mouse IL-21 receptor. Publishing research using ab13268? Please let us know so that we can cite the reference in this datasheet. I would like to receive the same antibody (ab13268), but from different lot. Thank you very much. Thank you for confirming these details and for your cooperation. The details provided enable us to closely monitor the quality of our products. I am sorry this product did not perform as stated on the datasheet and for the inconvenience this has caused. As requested, I have issued a free of charge replacement with the order number 984873. To check the status of the order please contact our Customer Service team and reference this number. Please note that this free of charge replacement vial is also covered by our Abpromise guarantee. Should you still be experiencing difficulties, or if you have any further questions, please do not hesitate to let us know. I wish you the best of luck with your research. PS: We unfortunately are returning this as a third antibody from same order 951635. I am not sure why all of these antibodies fail. I would probably recommend carefully checking the other reagents also. Thank you very much for sending the images. The images show this antibody is not staining at all. Also you have already tried different antigen retrieval procedures so perhaps the vial you have received is a bad vial. I am happy to replace the antibody with different lot or I can either provide a different replacement antibody against the same target. Could you specify which option you would like to go for? I will look forward to hearing to hearing from you. LOT NUMBER GR34185 ORDER NUMBER 3387799 DESCRIPTION OF THE PROBLEM Inespecific staining. IL21R has a high expression in B cells from the germinative center (lymph node). This receptor is localized in the cell membrane. This antibody doesn´t mark cell membrane from B cells and it is marking the cell nuclei. 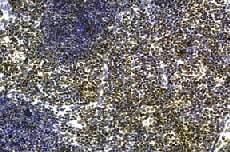 SAMPLE Tonsil PRIMARY ANTIBODY IL21R from AbCam (code: ab13268). Dilution --> 1:50, 1:100, 1:200. DETECTION METHOD In the automated immunostainer, Bond DAB Enhancer (Leica). Our results with this system are excellent, even when we use other antibodies from AbCam. In the manual immunostainer, DAB from the Zytomed Systems. Our results with this system are excellent, even when we use other antibodies from AbCam. POSITIVE AND NEGATIVE CONTROLS USED Positive controls --> tonsil. Negative controls --> the same tissues, but without to use the primary antibody ANTIBODY STORAGE CONDITIONS -20c FIXATION OF SAMPLE Formaldehyde ANTIGEN RETRIEVAL We performed 4 tests: Test 1: automated immunostainer (Visionbiosystems Bond), using citrate and EDTA as retrieval buffer Test 2: automated immunostainer (Visionbiosystems Bond), using citrate and EDTA as retrieval buffer, but with a different tissue from the test 1 (another tonsil) Test 3: manual immunostainer, using pressure cooker as heat mediated technique. In this test, i tried the antigen retrieval with citrate and EDTA Test 4: the same than the test 3, but using a different tissue (another tonsil sample). PERMEABILIZATION STEP Not applicable BLOCKING CONDITIONS We use an antibody diluent from DAKO that it dispenses the use of blocking solutions. We never had problems about non-specific staining, even when we use other antibodies from AbCam. SECONDARY ANTIBODY In the automated immunostainer, we use Bond Polymer Refine Detection (Leica). The test system is suitable for the detection of mono- and polyclonad primary antibodies and sera obtained from mice and rabbits. This system avoids the problem of background staining caused by endougenous biotin in the tissue. Our results with this system are excellent, even when we use other antibodies from AbCam. In the manual immunostainer we use Zytochem Plus HRP Polymer kit from the Zytomed Systems. The test system is suitable for the detection of mono- and polyclonad primary antibodies and sera obtained from mice and rabbits. This system avoids the problem of background staining caused by endougenous biotin in the tissue. Our results with this system are excellent, even when we use other antibodies from AbCam. HOW MANY TIMES HAVE YOU TRIED THE APPLICATION? 4 HAVE YOU RUN A "NO PRIMARY" CONTROL? Yes DO YOU OBTAIN THE SAME RESULTS EVERY TIME? Yes WHAT STEPS HAVE YOU ALTERED? Please, read the "antigen retrieval" box. All the explanation about this is also there. ADDITIONAL NOTES As it is possible to see in the attached pictures, the B cells from germinative center are negative, but there are some cells with nuclear staining. Thank you for your enquiry regarding ab13268 and for taking the time to provide some useful details of the experiments. I am very sorry to hear that you are having problems with this antibody. The protocol looks fine however I would be interested in seeing the image. Could you provide one? As mentioned in protocol you have used different dilutions; could you please specify the difference observed with different dilution? I will look forward to hearing from you soon. For each of these antibodies, specifically what type of antigen retrieval was used for IHC-formalin fixed, paraffin embedded sections? Thank you for your phone call. For ab13268, ab1662, and ab1669, the originator has informed me that the antigen retrieval method for IHC-formalin fixed, paraffin embedded sections involved treating the sections with antigen retrieval solution (Dako # S-1700, pH 6.0 or #S-3308, pH 8.0) and steamed for 20 minutes followed by cooling for 20 minutes. I will contact you again when I receive information regarding ab12953 and ab13396. Have a great weekend!